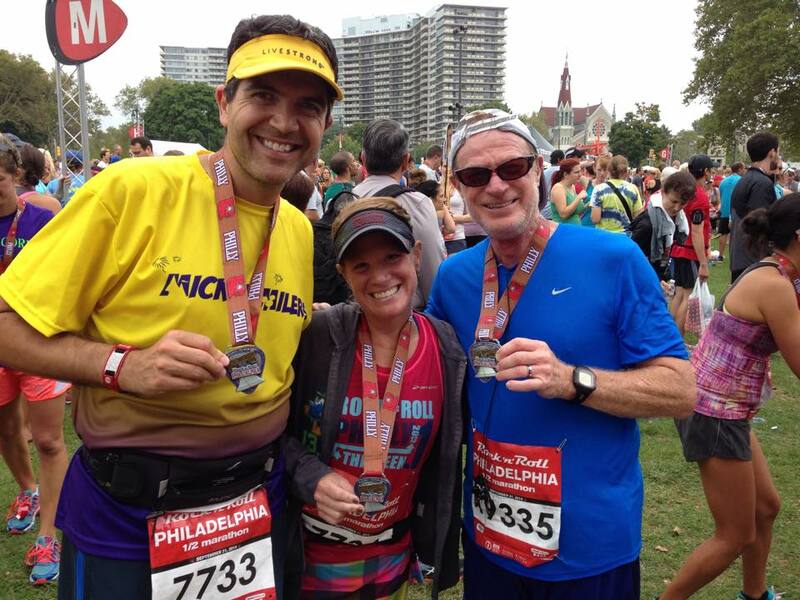 This weekend I ran the 2014 Philadelphia Rock ‘n’ Roll Half Marathon. I have run this event since 2011 and the last 3 years (2012-2014) I have had the opportunity to run the race alongside my wife, Shari. 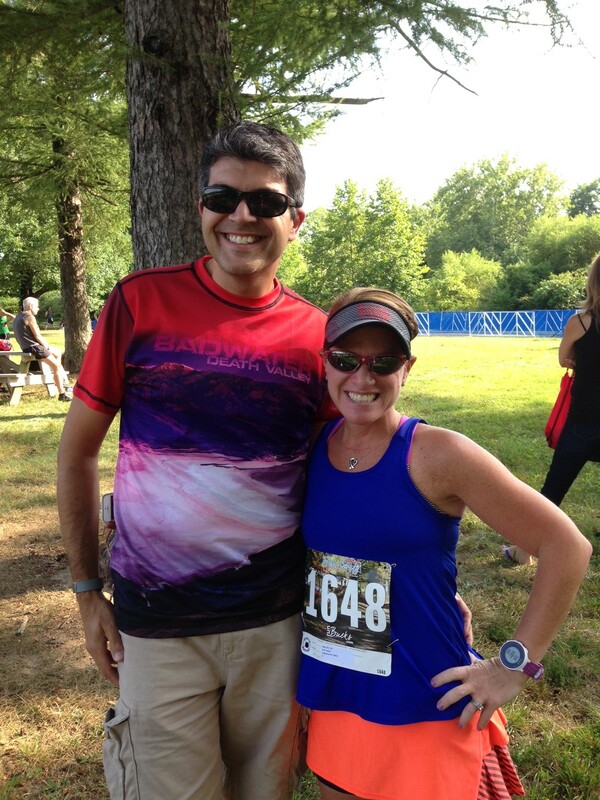 This was my 15th Half Marathon and 4th this year. With a few years of this race under my belt I feel like I am now able to make some reasonable comparisons to prior years and note what is good/bad compared to the prior years. 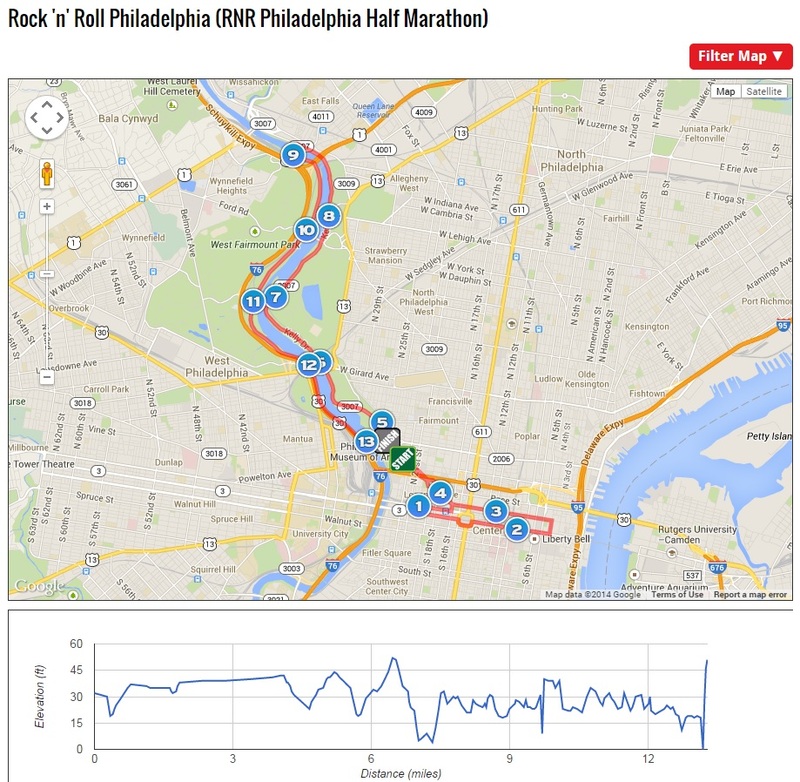 The course is the same as in the prior year and takes you from the start along the Benjamin Franklin Parkway, past Independence Hall and the National Constitution Center, through China Town and then the 8 mile loop from the Philadelphia Art Museum up the East River Drive (Kelly Drive) and back down the West River Drive (Martin Luther King Jr. Drive) and finally finishing at the steps of the Art Museum. The expo was held as in previous years at the Philadelphia Convention Center. This year the expo was positioned at the far end of the Convention Center near Broad Street. We had parked in our usual place when coming down to this expo and this was much further away (and not very well sign posted). I, like many other runners, entered the wrong end of the building. No big deal but I hadn’t thought to check on this being any different this year. 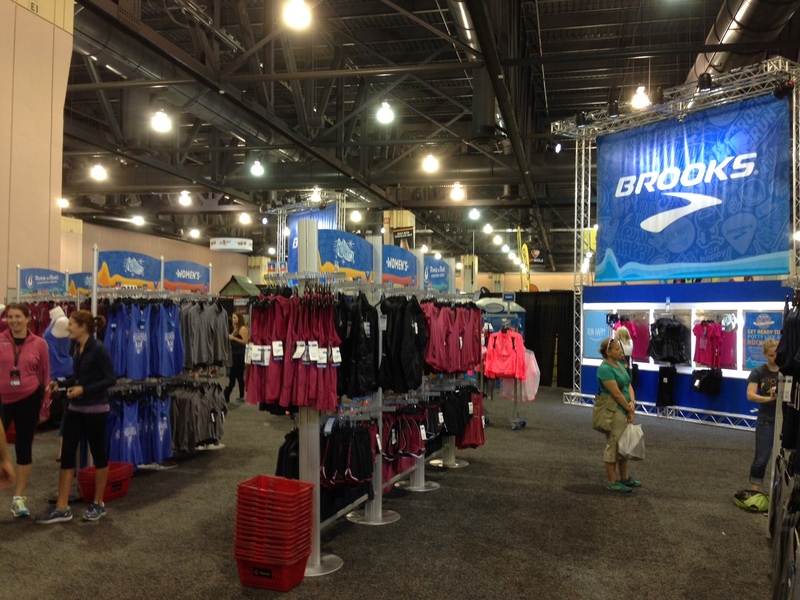 The expo as usual featured Brooks Running as a main sponsor and all the official race gear was Brooks apparel. All this is pretty much full price so I go to see what is new and then look at either the Brooks website or my favorite running store if I want to get something for a little less without the race logo. What was different this year was that the Brooks Run Happy Tour Bus was not present. Last year they had set up some a cool area with some chances to win some Brooks promos and play some games (remember the mechanical shoe/bull?) and they also had a shoe fitting consultation area. Back in 2011 they had a fun area and I think also in 2012. Nothing of that sort was there this year. Once into the expo proper there were the usual vendors you tend to see at expos (One More Mile, Spibelt, Fitletic, etc.) but what was noticeable was that there were few other races represented. There was a small table set aside for the New Jersey Marathon and the Baltimore Marathon but I didn’t see any other races present. There was no runDisney booth as there had been in prior expos. 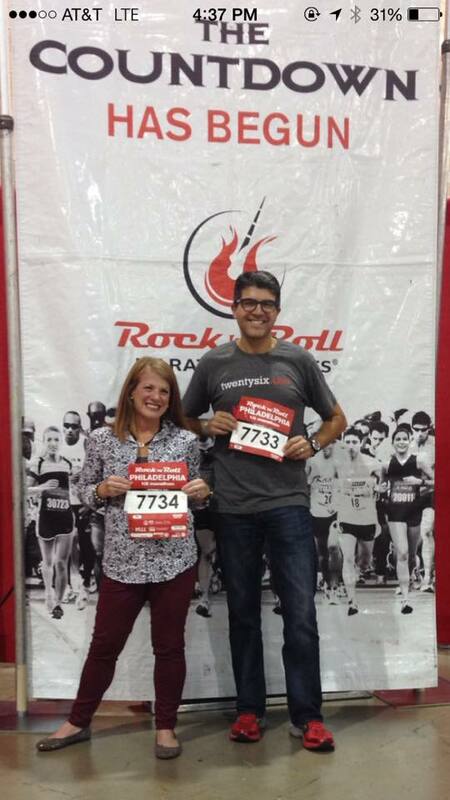 We did see the Atlantic City races and noticed that they have changed their banner (we were on the old one). Even the Rock ‘n’ Roll Series booth was pretty sparse compared to prior years. 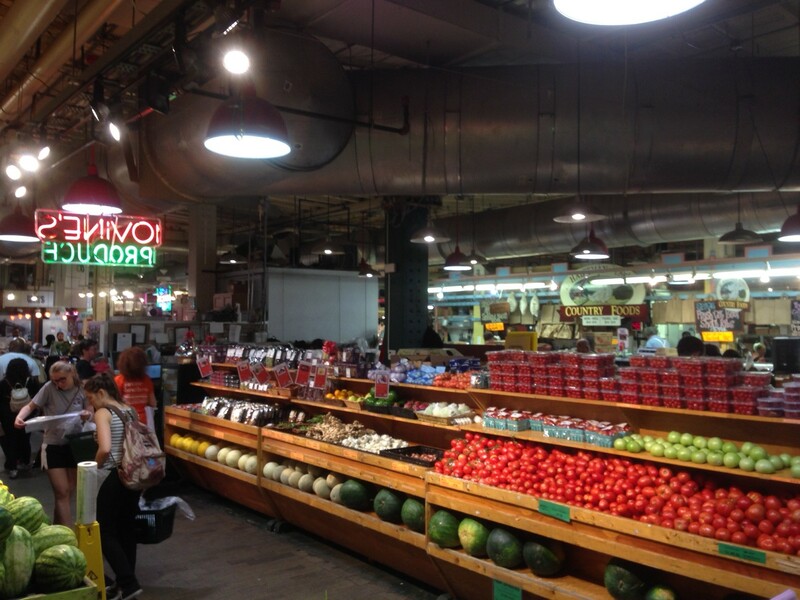 They used to have some fun props to take pictures and the displays were definitely more ‘blinged out’ in prior years. It was very low key this year. I did stop by the INKnBURN booth to say hello (I’m an INKnBURN Ambassador) and also managed to buy something else while there. They had a really cool banner on their stall which showed the races they were attending. I was lucky enough to get one of the drop bags that showed this art. Cool. (FYI – If you are interested in any of their gear you can use my Ambassador code for a discount on your purchases. My code is ‘INBians14’). Anyway, we got what we came for (our bibs and shirts) and I had plans to meet up with my fellow Mickey Milers for dinner. My wife and the boys headed back home and I stayed around for a while until it was time to meet for dinner. Fortunately the Convention Center is located on top of the Reading Terminal Market and so that is a great place to wander and investigate (plus it got me out of spending any more money at the expo). 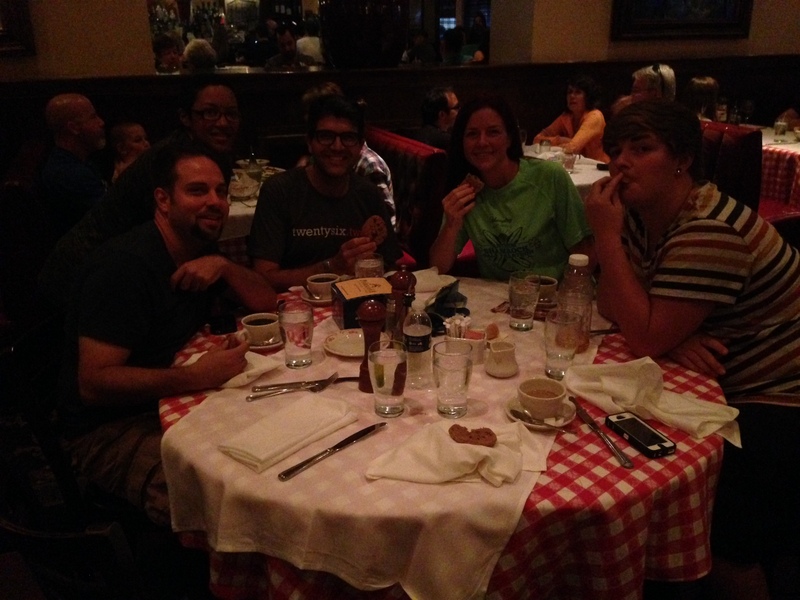 I grabbed some fresh baked cookies and headed to Maggiano’s Little Italy to meet up with my fellow Mickey Milers who were in from out of town and able to make it to dinner (Janee, Brittany and David). The cookies were good. At home that night we did our pre-race routine of setting out our gear so that we could be up and out early for race day. 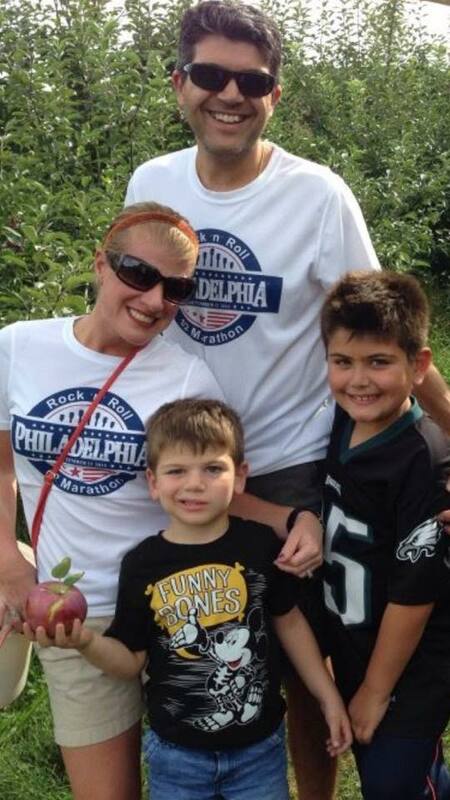 At 6am on race day we picked up my father-in-law who was running the event too and headed down to Philadelphia. It was a warm morning as we arrived and there was no need for any throwaway shirt or trash bag to wear in the corrals. As we were walking to the corrals I met up with my fellow Mickey Miler, Joe, who I ran with in the Gary Papa 5K back in June. He has been working with a coach and the results are definitely showing. It was really crowded near the bag check and port-a-potties and it took a while to get through the lines. 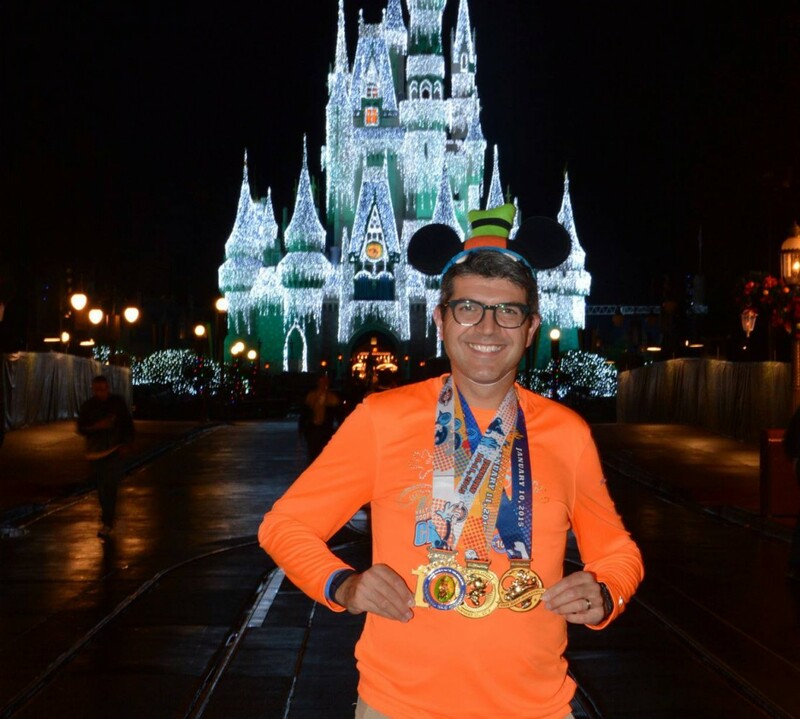 I wasn’t able to attend the pre-race photo for the Mickey Milers that morning as I was in line. Once we were all checked into the gear trucks we made arrangements with my father-in-law where to meet post-race and Shari and I headed to our corral for the start. We were in corral 7 so not too far back. We saw the last corral (22) starting as we were heading back up the Parkway around mile 4. My father-in-law said he was in his corral (19) for almost 40 minutes before crossing the start line. 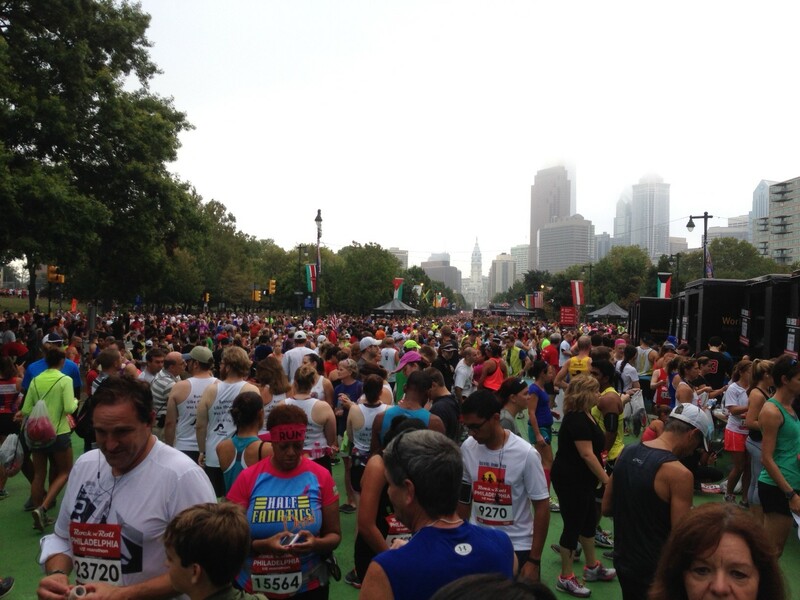 It was a big race with 15,537 finishers (per the official results). We set off just a few minutes behind the leaders and started the race. We may have gone out too fast (well, not may, we did) but we had in mind a goal of breaking 2 hours for the day. 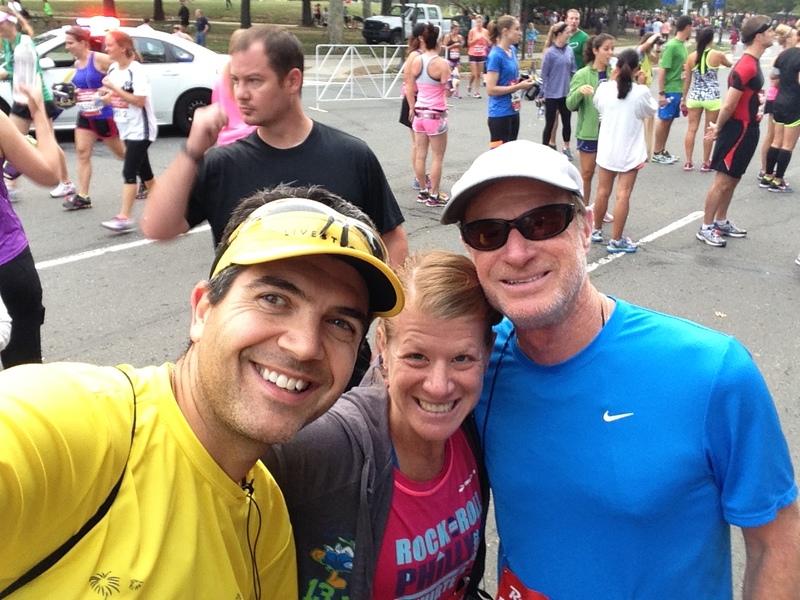 Around mile 2 we bumped into our friend Mayela and her friend Matt. 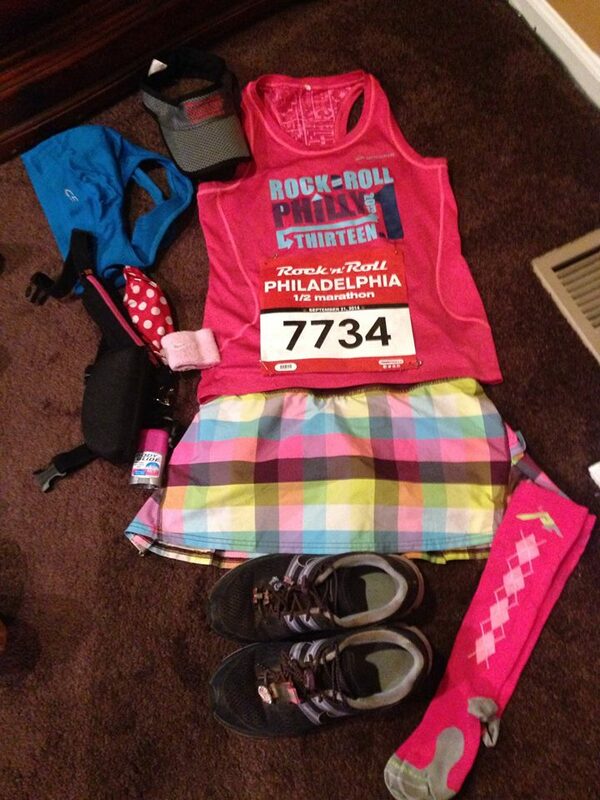 We have run half marathons in 3 States (including California) and at some point during these races we have run into her. She seems to be our lucky charm. 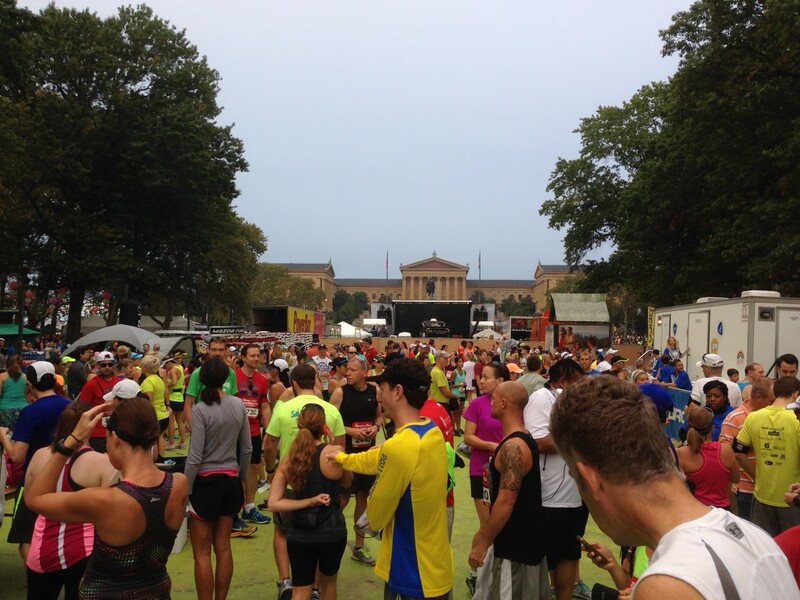 Running down the Benjamin Franklin Parkway, John F Kennedy Boulevard and Market Street provides a lot of space for the runners as the streets are wide, but then around mile 3 you turn into the older part of the city and then the streets get a little narrower and runners start to bunch up. It is not unbearable but it does get noticeable in spots. However, the run up Arch Street (through Chinatown and behind the Convention Center) leads directly back to the Parkway and the loop around the River which widens up quite a bit. 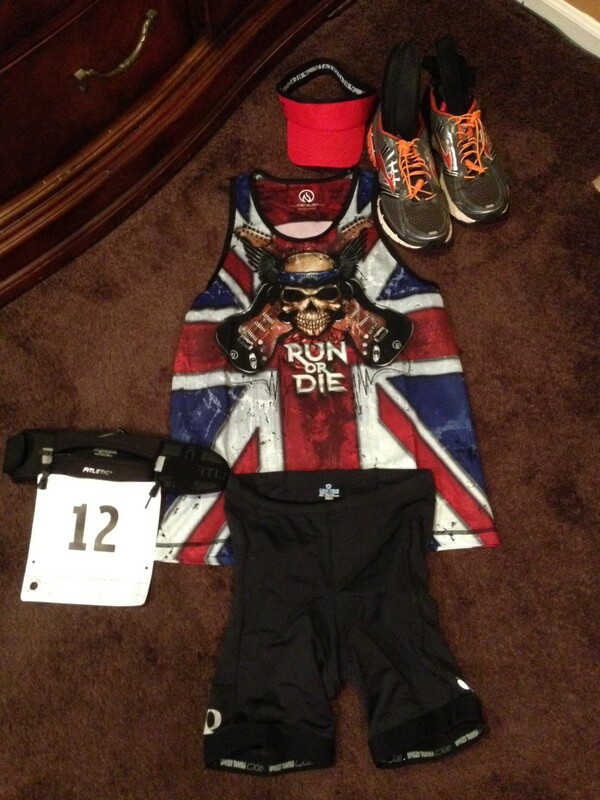 This is, of course, a Rock ‘n’ Roll race and so we are to expect bands on the course throughout the race. Anyone who is a first timer to these races may be somewhat disappointed by the number of performers out on the course. I think it was similar to the last couple of years so I wasn’t too surprised to see them spread out throughout the course. There were definitely lots of quiet stretches around the river. 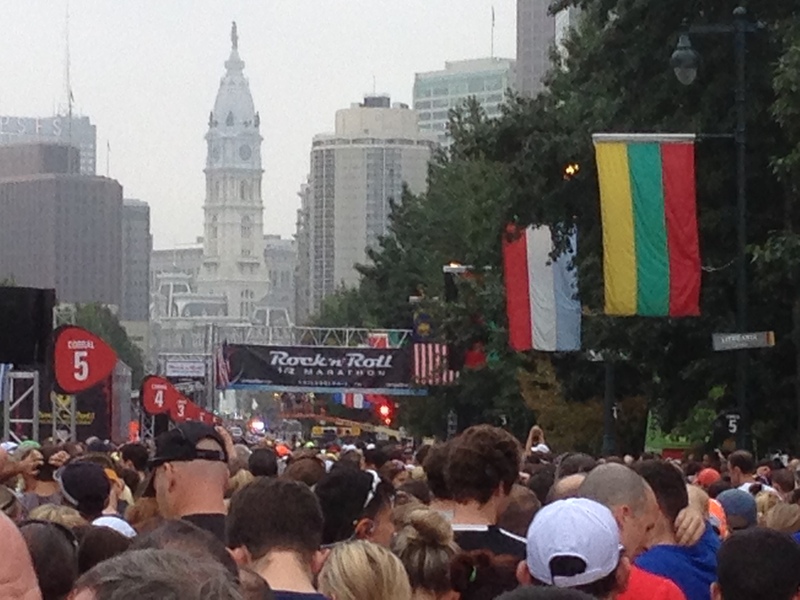 The Philadelphia Marathon (and Half Marathon) in November seems to have much more enthusiastic and deeper crowds along the route. 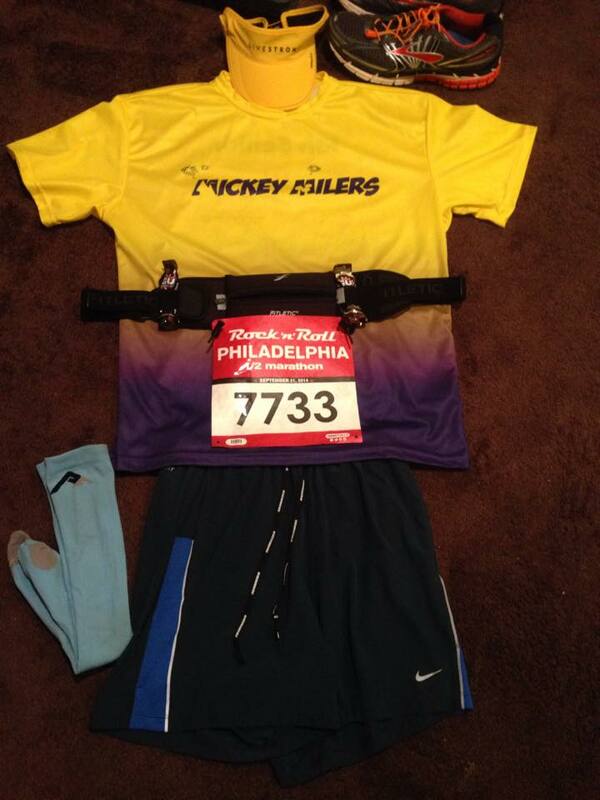 One thing of note for anyone considering this race is that for all the half marathons held in Philadelphia that I have run (Rock ‘n’ Roll, Philadelphia Marathon/Half Marathon and the LOVE Run) all have different routes around the city. That is a plus as it does offer variety to the runner and you get a different experience every time. 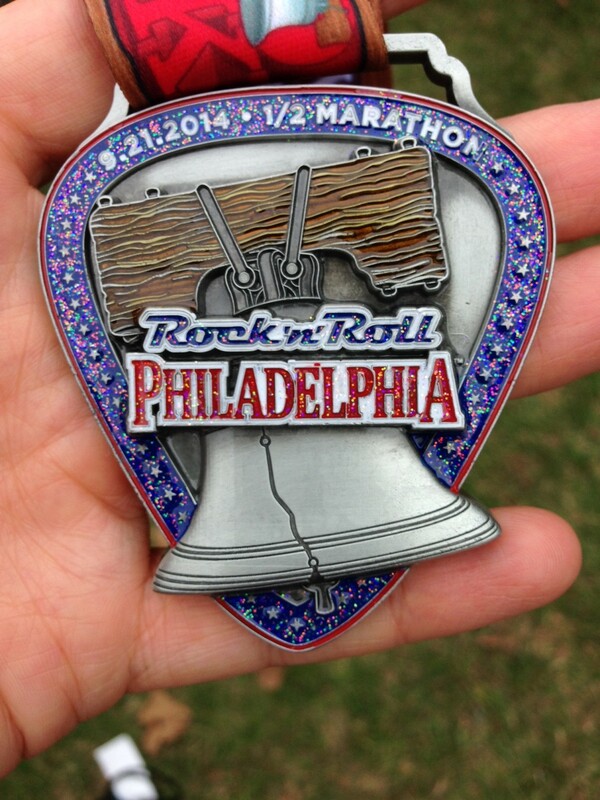 I have to say that my favorite route is the first half of the Philadelphia Marathon. With it being a warm morning and already being thirsty in addition to having gone out too fast it all began to take its toll on us. Both my wife and I are in the peak of training for the Baltimore Marathon next month and we are in the middle of those 20 mile runs so understandably we are a little fatigued. In addition, my wife worked the day before and was on her feet (and apparently not hydrating too much) while she was working an event. I think it all caught up with us today. My wife is a speedy little one and we both have half marathon PRs in the low 1:50s so we were thinking 2 hours was definitely possible. We had finished the last two years at 2:05 and 2:03 so we figured we would be around 2:00 without issues. This unfortunately did not turn out to be the case this year. We slowed down but the damage was done around mile 4. My wife developed a bad stich in her side and we took it easy, walked it out when necessary and just plugged through. Around mile 8 as we cross over the Falls Bridge to the other side of the river she felt a little better and you can see from the splits that we did indeed pick up the pace. It was getting warmer but thankfully the sun was still behind the cloud cover so it wasn’t too hot but it was certainly humid. The last few miles were very much a ‘head down and focus’ effort so nothing too exciting (although of course more people knew my wife out there). One thing I noticed as did a few other runners along the course with us (and my father-in-law agreed) was that the mile markers seemed off. This is a certified course and I know that we non-elites tend to weave around people a lot but by mile 3 my Garmin GPS watch said 3.25 miles. That 0.25 mile differential was consistent through the rest of the race so I guess those wide roads early on in the race added all that extra distance vs. going at the angles. Oh well, extra calories burned. 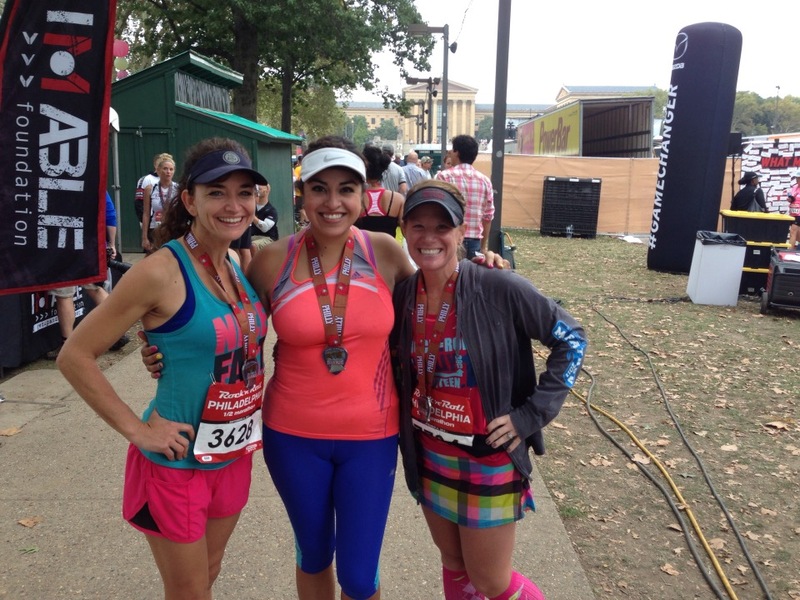 We finished the race in 2:07. Not a disaster but I think we were both disappointed. My wife especially was a little disappointed until I pointed out all the factors that I mentioned earlier (fatigue, humidity and dehydration). It wasn’t a bad effort and we were both still smiling at the finish which is what really counts. We will chalk this up to experience and better prepare in the future. We got our medals which for the first time actually had a decent ribbon attached. I guess they read our runners survey comments from the last two years finally. We cooled down and ate a little while we waited for my father-in-law to finish. This was his longest run in many years (he’s making a comeback!!) and he guessed he would run the course in 2:30. He actually finished in 2:31. Nice. As we waited we listened to the awards presentation where we learned that Deena Kastor had set 5 (yes 5) Masters records during the day and that the men’s winner had run a 59:20 Half Marathon. Wow. This was followed by ‘Rusted Root’ the headline performers for the post-race concert. On the way back to our car we bumped into Mayela and her crew and my fellow Mickey Milers who had finished around the same time. Joe broke 2 hours in the Half for a new PR. Well done Joe. After a few pictures we headed back to the parking lot to drive (a slow creep) out of the city and head home for a full afternoon of activities. Overall it was a great weekend and the race result wasn’t too disappointing in the grand scheme of things. 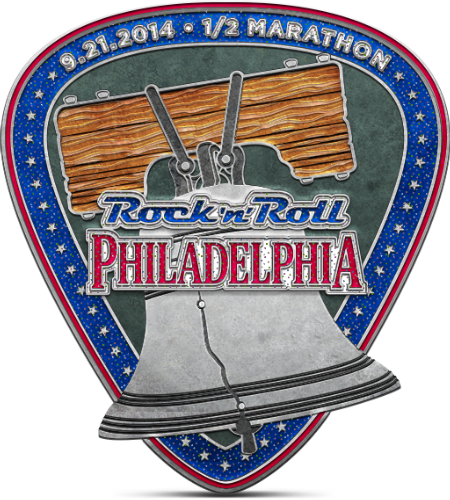 Having run this event 4 years in a row now I may look further afield next year for some Fall races. We had a limited schedule this year due to a family wedding and being away during November. I do like the locations for some of the other Rock ‘n’ Roll series races and so I would definitely take an interest in running another one of their events. My wife mentioned another West Coast trip so we shall see. 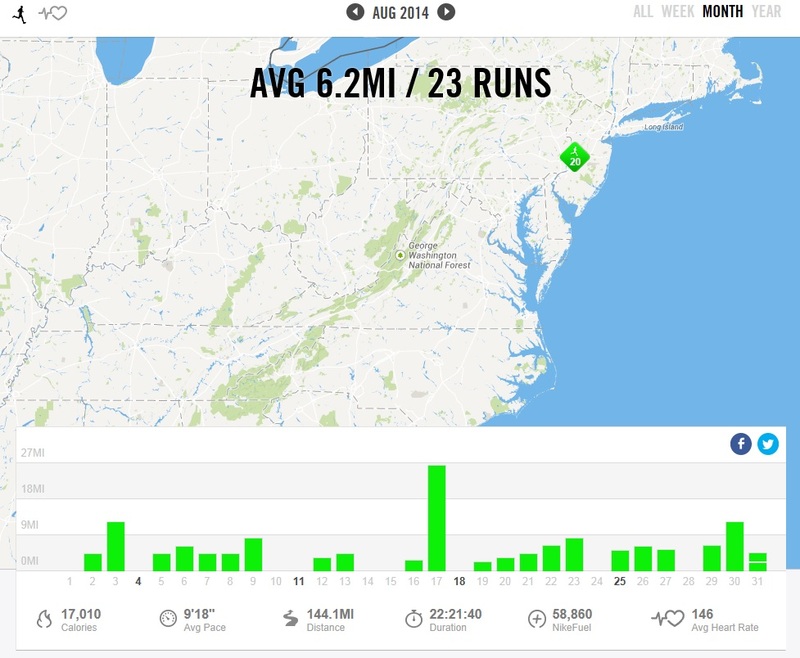 I ran 144 miles this month, although that is not the full story. 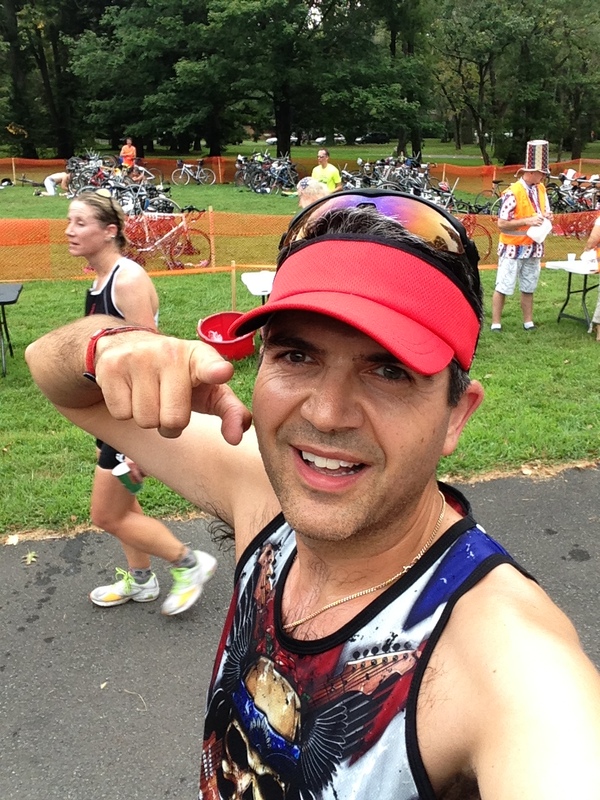 August was the month I ran the ‘Chasing The Unicorn’ Marathon that I had been training for all summer. It didn’t quite go according to plan but overall I had a great experience and came out feeling good. I couldn’t ask for more than that. I learned a lot about digging deep that day. 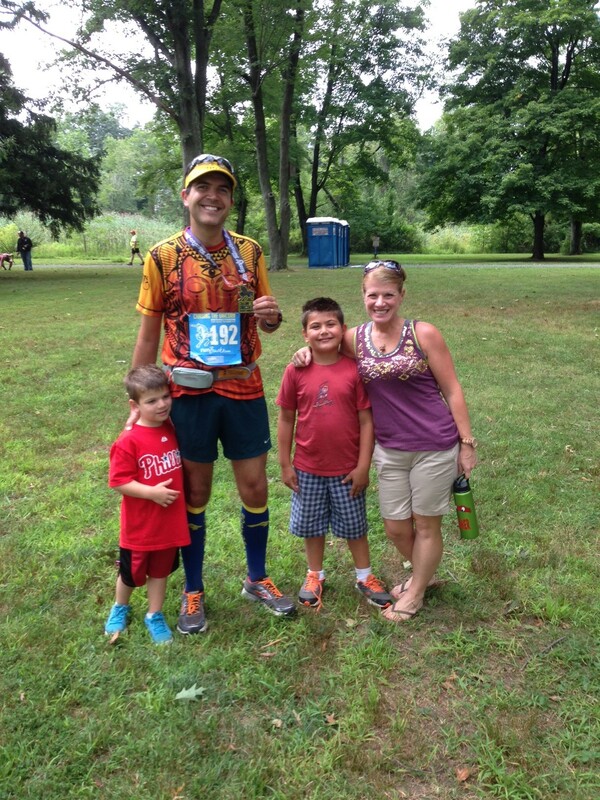 Happy to be with my family at the finish. The best cure for a bad race. I also celebrated my 4 year ‘runiversary‘ and had time along with the marathon I ran to reflect on how far I have come and the great times I have experienced through running. I guess it’s like a 4 year runner’s high at this point. I am still motivating myself everyday and looking forward to planning my 2015 calendar. Most of this month was taken up with tapering for the marathon, getting the boys ready for back to school and then taking a few days with them to have a last few vacation days. We took trips to the Philadelphia Zoo, to the New Jersey Aquarium and seemed to play lots of mini golf. The boys had a blast. They wore me out more than the marathon. That is a good thing. 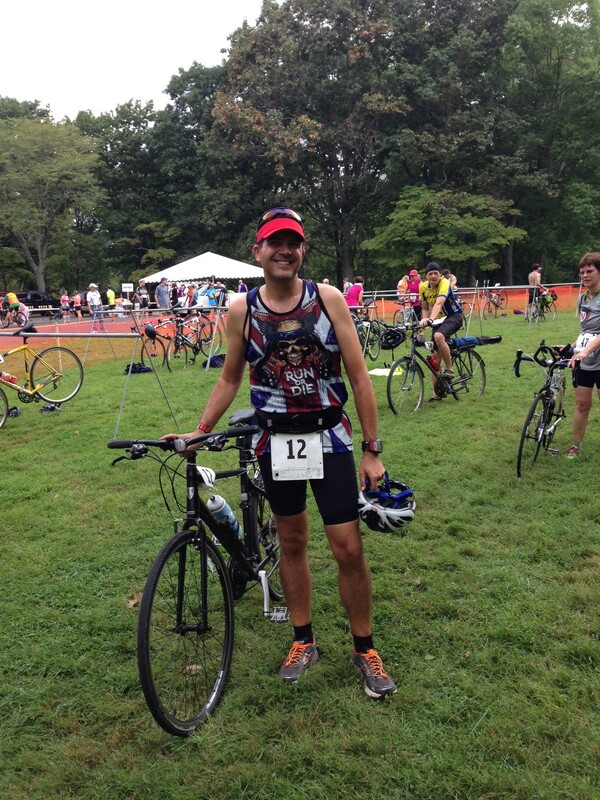 Finally, I ran the Bucks County Duathlon over Labor Day weekend, setting a new PR in the process. I was very happy with my running performance that day considering all the training I have been putting in. Some days I feel pretty tired but it seems to be paying off. 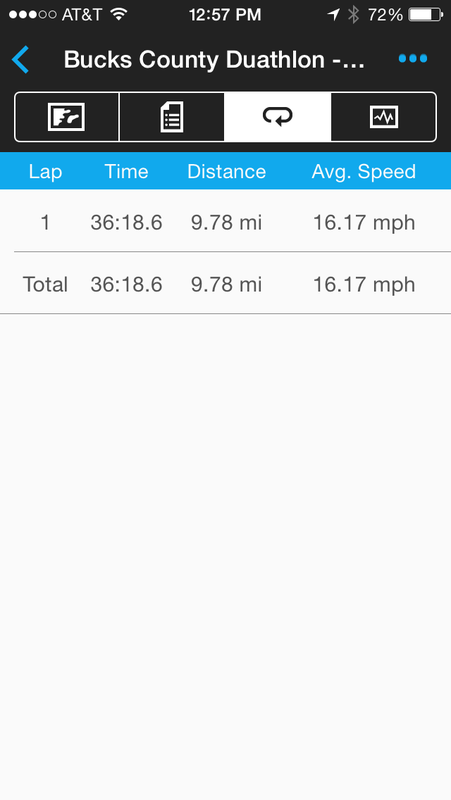 A good day for a PR as I headed home. 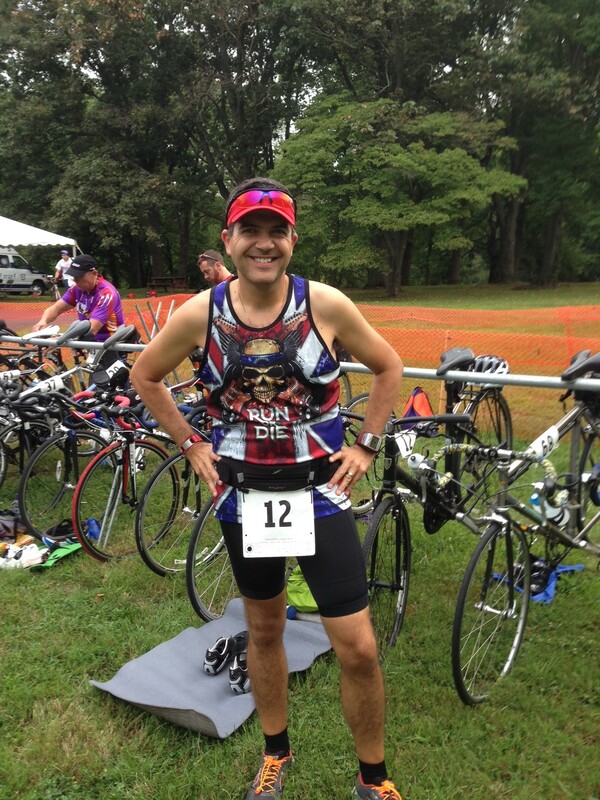 This weekend I participated in the 5th annual Bucks County Duathlon. 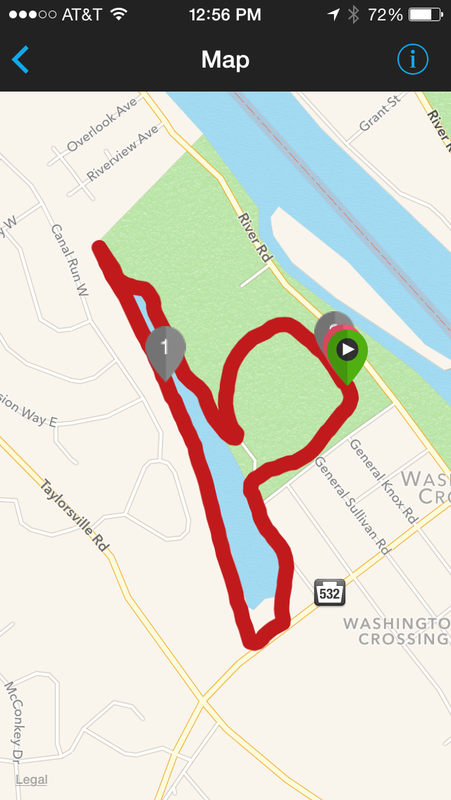 This is a combined 2 mile run, 10 mile ride and 2 mile run which starts and finishes at Washington Crossing Park on the Pennsylvania side of the Delaware River alongside the Delaware Canal (the same location of my recent marathon). 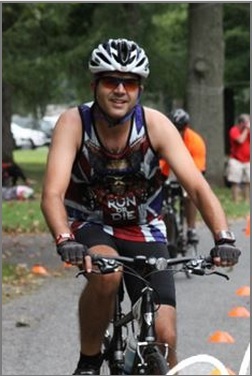 I had participated in this event in 2011 (on a borrowed bicycle) and in 2012 (on my own bicycle) and had to miss it in 2013 for a family wedding. It’s a small event, less than 200 people, but some of these folks are serious triathletes and their clubs were represented by team tents at the staging area. 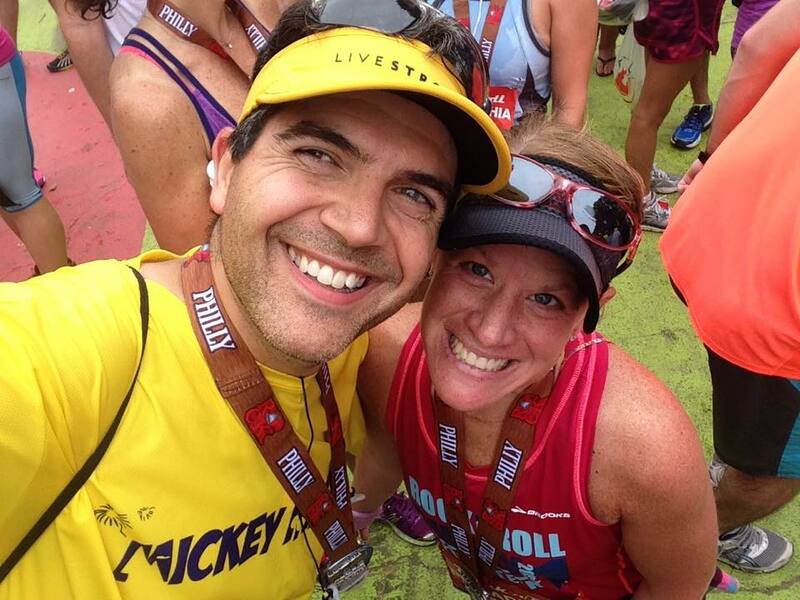 It is used as a fundraiser to support Missy Flynn, a local triathlete who suffered a brain aneurysm back in 2010 and needs help and support for ongoing medical costs. Race packet pickup was held at the Newtown Bike Store in the week leading up to the event. 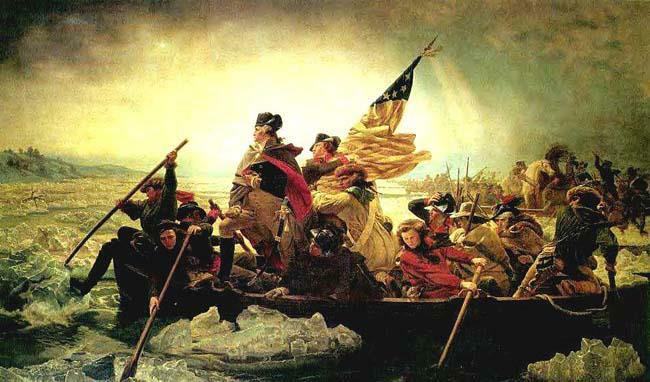 Race swag was a technical t-shirt with a silhouette of the famous ‘Washington Crossing the Delaware’ painting. 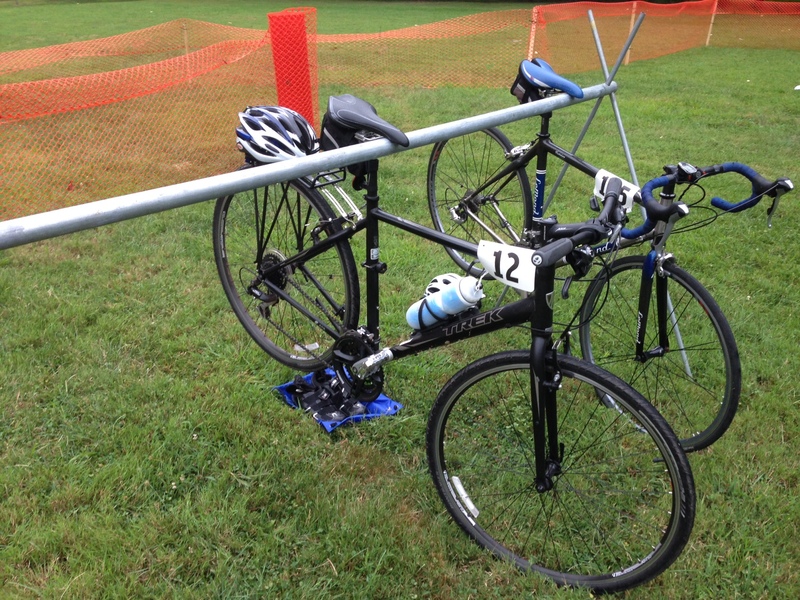 The race started at 8am on Sunday morning but you needed to leave enough time to set up your bicycle and related gear in the transition area. I arrived with enough time to check my tires, pick a spot near the end of a row and set out my cycling shoes (my bicycle uses clip pedals), helmet, gloves, etc. I also brought out my old Garmin 305 multisport watch. 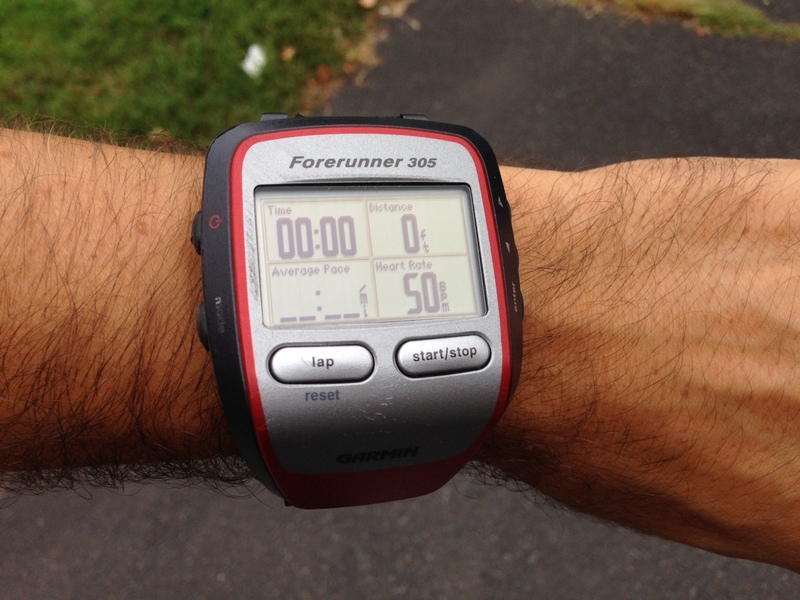 Having run with the Garmin Forerunner 220 since earlier this year it seemed huge but does what I needed. I only switched to the 220 because the 305 took forever to locate my position. I had plenty of time for the GPS to find me on race day. I set up my gear and waited for the start of the race. 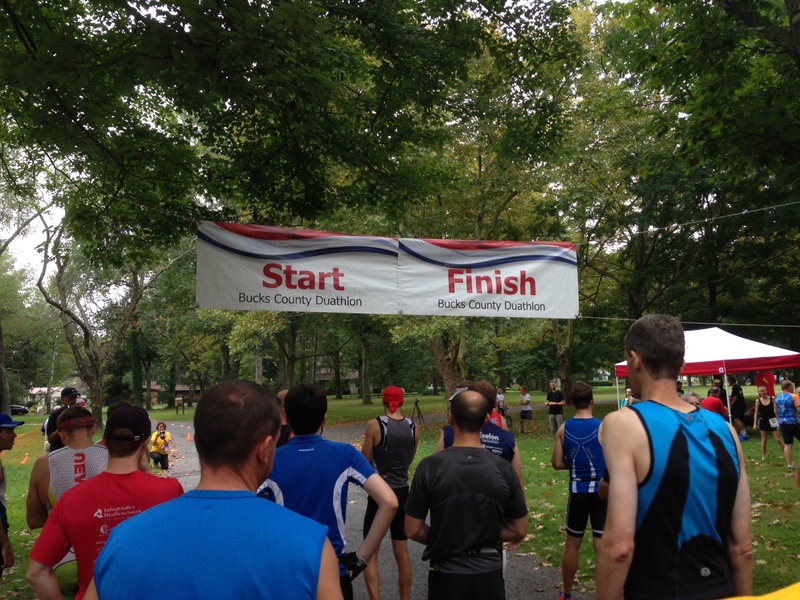 The race consisted of a 2 mile loop starting in the park, out along the canal and back to the transition area. There was a timing mat at the entrance and exit of the transition area where you had to walk (run) your bike out and back in. The ride consisted of an out and back 2.5 mile ride which we did twice for a total of 10 miles before the returning our bicycles and running the second loop which was the same as the first. The race director gave pre-race instructions around 7:45am and we all lined up according to our waves. It was elites first then age groups male and female every minute after. One of the athletes played the National Anthem on their trumpet and then the horn sounded and the waves all went off as directed. 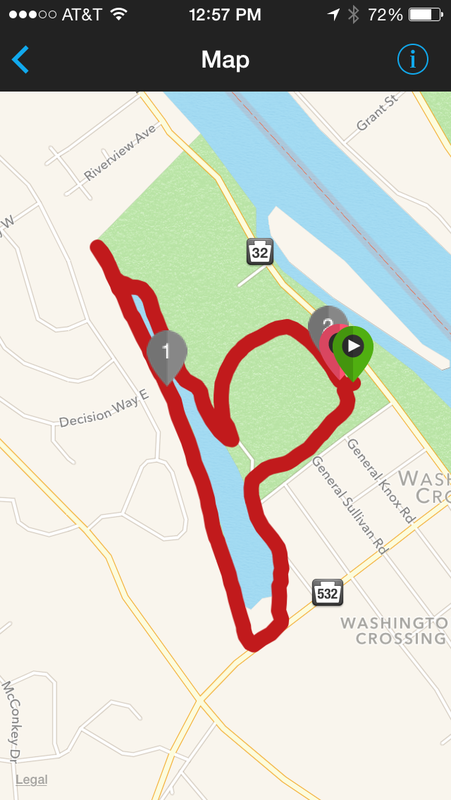 I ran the first loop pretty steadily. 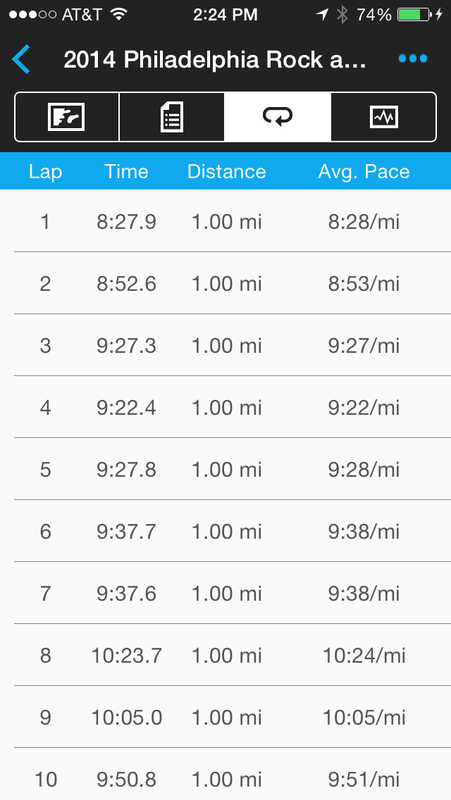 As each running leg was short I decided to not use my usual run/walk/run method and just go for it. I didn’t go all out as I knew I still had a ride and a second run to do but I did push a little harder than my regular pace. This paid off with a first leg of the duathlon running splits less than 8 minutes/mile. Even though I was passed by many runners soon after the start, along the course of the 2 miles I managed to keep a steady pace and reel a few of the runners back and pass then in the last half mile or so. 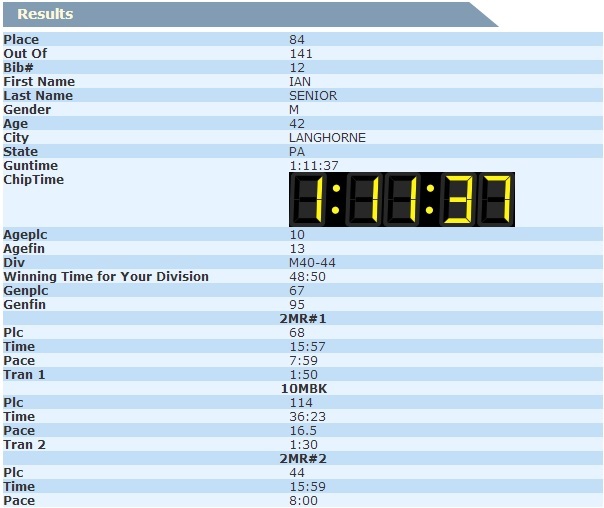 Based upon the results I was placed 68/141 for the first run. 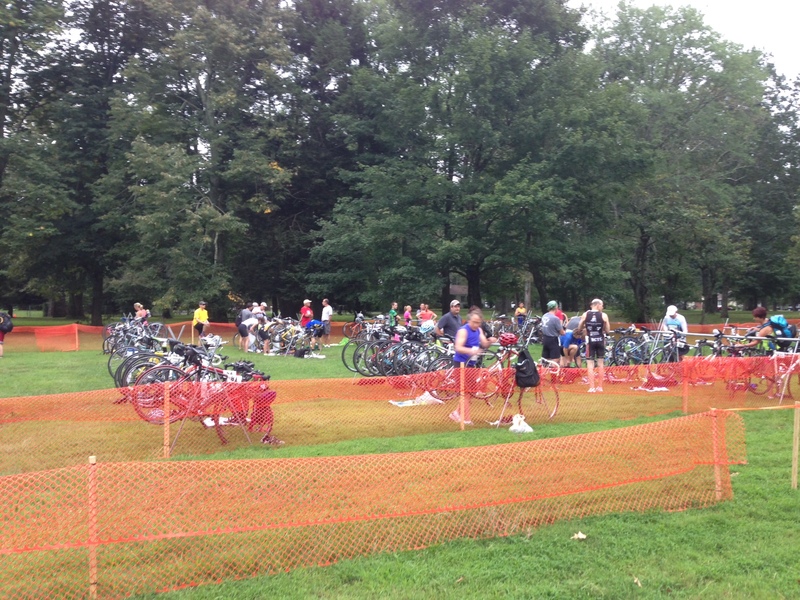 From there it was on to the transition area. This seemed to go fine although I did struggle to put on one of my running gloves in the humidity and rush of the morning. Then I ran my bicycle out of the transition area to where we were allowed to mount the bicycle and headed off on the road for the ride leg of the event. 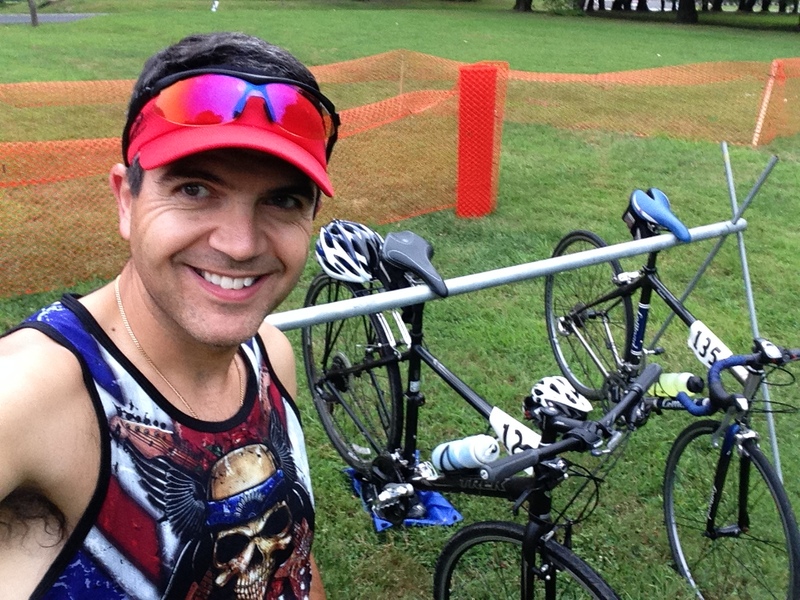 This is where I was separated from the real triathletes in the race. I own a hybrid bicycle (Trek FX 7.2) not a road or tri bicycle that it seemed the majority of folks out there were riding. Now as fast as my legs could pedal I was being passed constantly on the second half of the ride. Those with the right gear (lightweight/aerodynamic) just flew past me on the road. Being followed by a local police cruiser…not for speeding obviously!!! 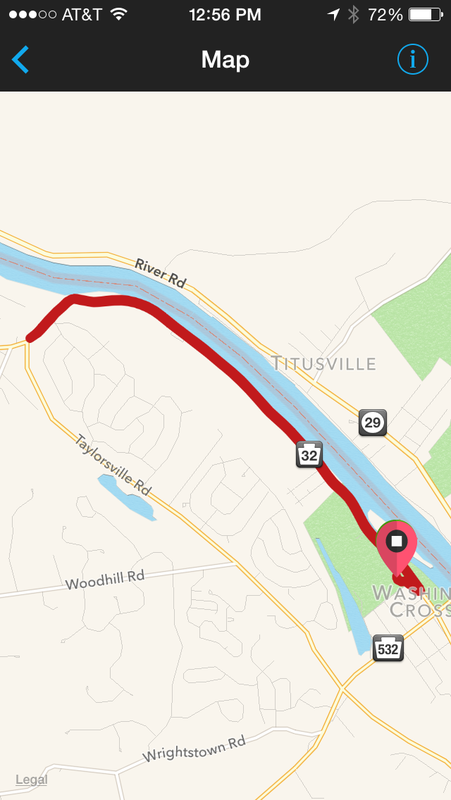 I averaged about 16 miles per hour on the road (it was fairly flat) but the speedier folks were pushing well beyond 20 miles per hour and it showed as I saw all the folks I had run past were now ahead of me. 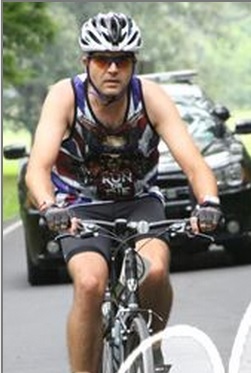 I was placed 114/141 for the bicycle portion. Ouch!!! 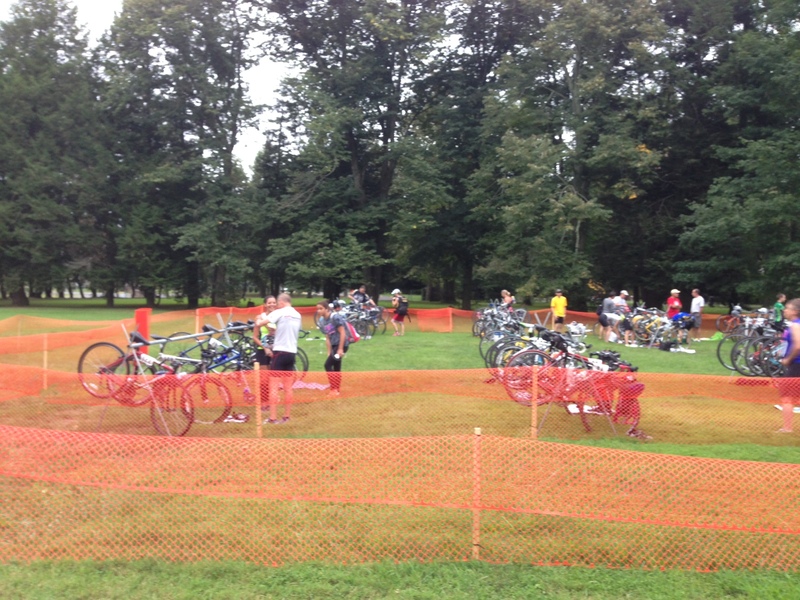 Then back to the transition area. This is the point in the race that I always joke that the difference between the first and last runs are you start out like Forrest Gump and come back like Lieutenant Dan. 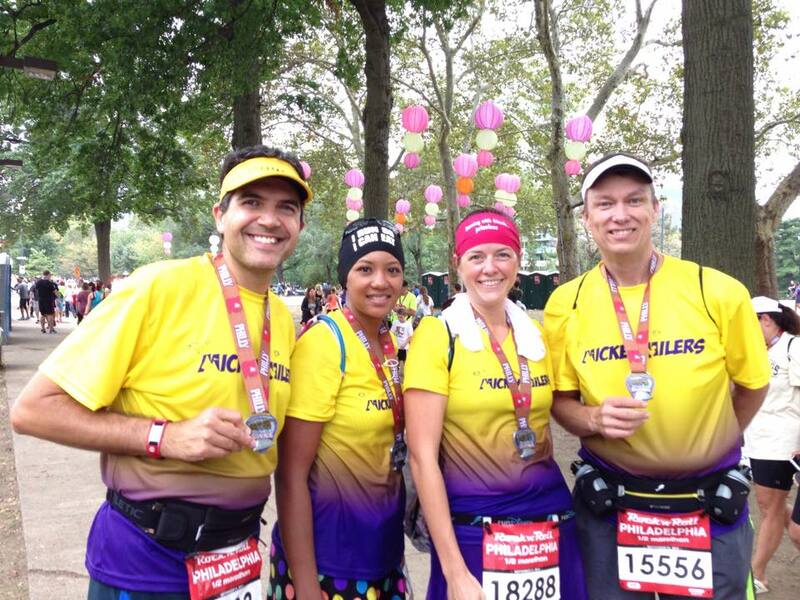 I started to run on the third and final part of the race and my legs were like jelly. I could just about feel my feet and it just felt weird for at least the first half mile. I just made constant motion and moved forward as best I could. I was a little slower for the third part of the race, but then so was everyone else. 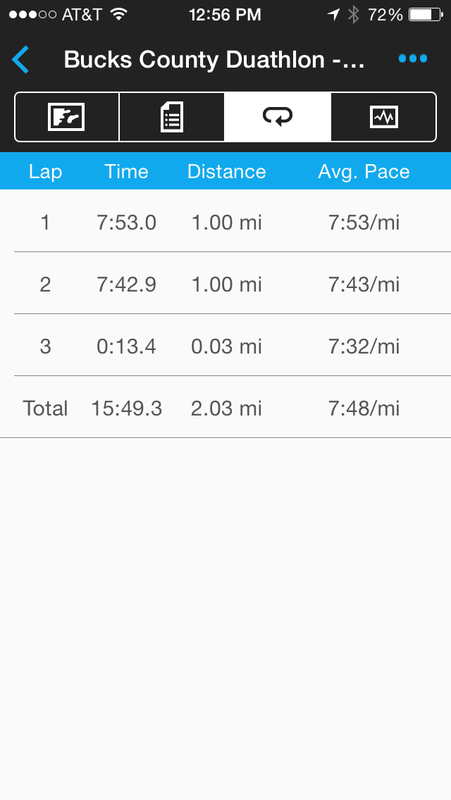 Like before I didn’t use the run/walk/run method and just went for it as best I could. 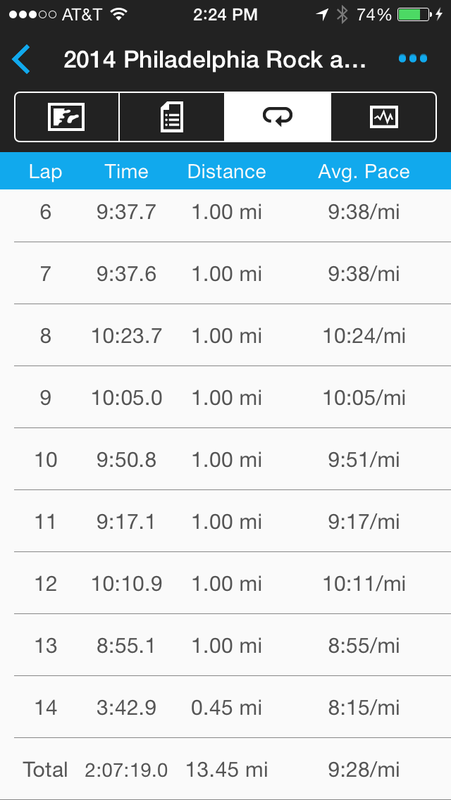 Not flat-out as my legs probably would not have taken that effort, but just fast enough to maintain a sub 8 minute mile. I noticeably passed more people on this second run and this showed as I finished this final leg 44/141, better than the first run even though the time was 2 seconds slower. I pushed hard for this last leg. In the post race area there were places to check your final times as well as post race refreshments (bagels with cream cheese, bananas and peanut butter & jelly sandwiches). I took to a picnic table to cool down and stretch and enjoy my bagel as I watched the other competitors run in. It was a beautiful but warm morning. I worked pretty hard on the day but was very happy with the result. 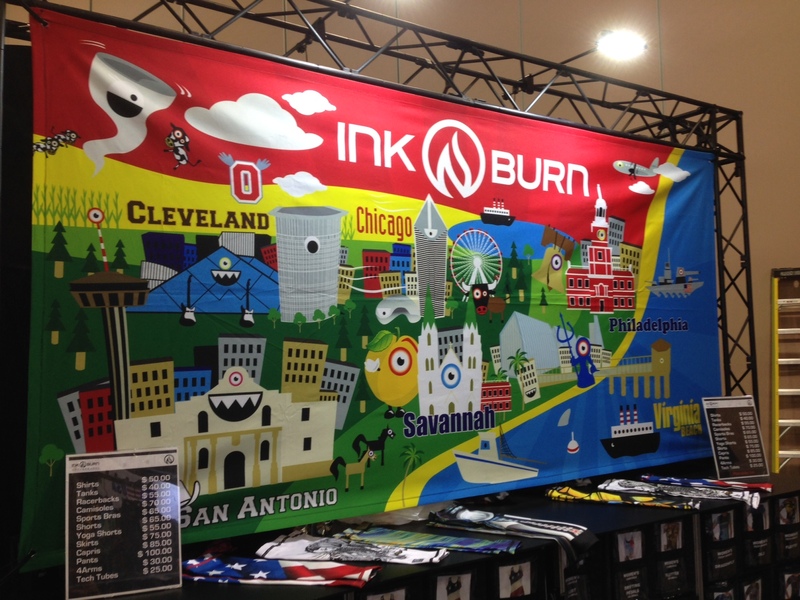 If you are interested in any of the INKnBURN gear, please feel free to use my Ambassador code (INBians14) on their site for a 15% discount on any of their merchandise. 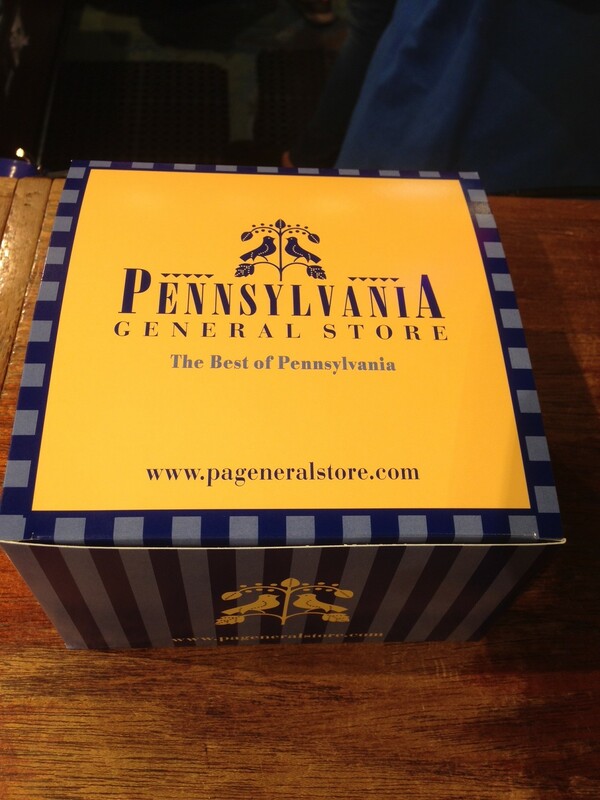 Take a look at their site and hope you find something you might like to try.